Arts educator Kelly McKay and co-host performing artist Kristen Stoeckeler form the team of Broadside. 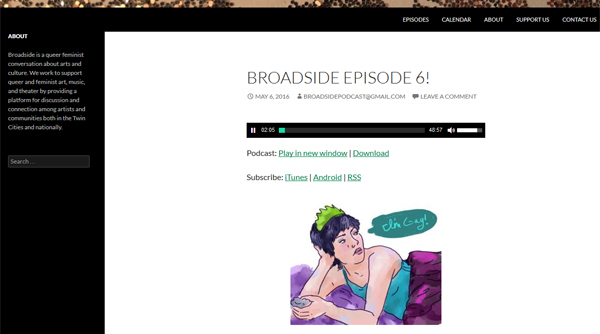 They make the Broadside podcasts with queer feminist conversation about arts and culture which they publish on their website: Broadsidepodcast.com. They are based in the Twin Cities (Minneapolis–Saint Paul), USA. In the episode #6 of Broadside Kelly and Kristen interview queer cartoonist Anna Bongiovanni about being a ‘queermo’ in the world making art. They also review the graphic novel Nimona by Noelle Stevenson, as well as they review the film Blue is the Warmest Color (2013) based on the graphic novel of the same title by Julie Maroh.